THE WANDERINGS OF VICRAM MAHARAJAH. THERE was once upon a time a Rajah named Vicram MahaI rajah 1 who had a Wuzeer, named Butti. 2 Both the Rajah and his minister were left orphans when very young, and ever since their parents' death they had lived together; they were educated together, and they loved each other tenderly--like brothers. Both were good and kind--no poor man coming to the Rajah was ever known to have been sent away disappointed, for it was his delight to give food and clothes to those in need. But whilst the Wuzeer had much judgment and discretion, as well as a brilliant fancy, the Rajab was too apt to allow his imagination to run away with his reason. Under their united rule, however, the kingdom prospered greatly. The Rajah was the spur of every noble work, and .the Wuzeer the curb to every rash or impracticable project. In a country some way from Rajah Vicram's there lived a little Queen, called Anar Ranee (the Pomegranate Queen). Her father and mother reigned over the Pomegranate country, and for her they made a beautiful garden. In the middle of the garden was a lovely pomegranate tree, bearing three large pomegranates. They opened in the centre, and in each was a little bed. In one of them Anar Ranee used to sleep, and in the pomegranates on either side slept two of her maids. Every morning early the pomegranate tree would bend its branches gently to the ground, and the fruit would open, and Anar Ranee and her attendants creep out to play under the shadow of the cool tree until the evening; and each evening the tree again bent down to enable them to get into their tiny, snug bedrooms. Many princes wished to marry Anar Ranee, for she was said to be the fairest lady upon earth. Her hair was black as a raven's wing, her eyes like the eyes of a gazelle, her teeth two rows of exquisite pearls, and her cheeks the colour of the rosy pomegranate. But her father and mother had caused her garden to be hedged round with seven hedges made of bayonets, so that none could go in or out; and they had published a decree that none should marry her but he who could enter the garden and gather the three pomegranates in which she and her two maids slept. To do this, kings, princes, and nobles innumerable had striven, but striven in vain. Some never got past the first sharp hedge of bayonets; others, more fortunate, surmounted the second, the third, the fourth, the fifth, or even the sixth; but there perished miserably, being unable to climb the seventh. None had ever succeeded in entering the garden. Before Vicram Maharajah's father and mother died, they had built, some way from their palace, a very beautiful temple. It was of marble, and in the centre stood an idol made of pure gold. But in course of time the jungle had grown up round it, and thick straggling plants of prickly pear had covered it, so that it was difficult even to find out whereabouts it was. Then one day, the Wuzeer Butti said to Vicram Maharajah, 'The temple your father and mother built at so much pains and cost is almost lost in the jungle, and will probably ere long be in ruins. It would be a pious work to find it out and restore it.' Vicram Maharajah agreed, and immediately sent for many workmen, and caused the jungle to be cut down, and the temple restored. All were much astonished to find what a beautiful place it was! The floor was of white marble, the walls exquisitely carved in bas-reliefs and gorgeously coloured, while all over the ceiling was painted Vicram Maharajah's father's name, and in the centre was a golden image of Gunputti, to whom the temple was dedicated. The Rajah Vicram was so pleased with the beauty of the place, that on that account, as well as because of its sanctity, he and Butti used to go and sleep there every night. 'And what is this act of devotion?' asked Vicram Maharajah. 'It is this.' (He thought his father answered.) 'You must fasten a rope to the top of the tower, and to the other end of the rope attach a basket, into which you must get head downwards, then twist the rope by which the basket is hung three time; and as it is untwisting, cut it, when you will fall head downwards to the earth. 'If you fall on either of the hedges of bayonets, you will be instantly killed; but Gunputti is merciful--do not fear that he will allow you to be slain. If you escape unhurt, you will know that he has accepted your pious act, and may without danger take the treasure." The vision faded, Vicram saw no more, and shortly afterwards he awoke. Vicram Maharajah then caused excavations to be made below the tower, under which he found an immense amount of treasure. There were mountains of gold, there were diamonds, and rubies, and sapphires, and emeralds, and turquoise, and pearls; but he took none of them, causing all to be sold and the money given to the poor, so little did he care for the riches for which some men sell their bodies and souls. Another day, the Rajah, when in the temple, dreamed again. Again his father appeared to him, and this time he said, 'Vicram, come daily to this temple and Gunputti will teach you wisdom, and you shall get understanding. You may get learning in the world, but wisdom is the fruit of much learning and much experience, and much love of God and man; wherefore, come, acquire wisdom, for learning perishes, but wisdom never dies.' When the Rajah awoke, he told his dream to the Wuzeer, and Butti recommended him to obey his father's counsel, which he accordingly did. Daily he resorted to the temple and was instructed by Gunputti; and when he had learnt much, one day Gunputti said to him, 'I have given you as much wisdom as is in keeping with~ man's finite comprehension; now, as a parting gift, ask of me what you will and it shall be yours--or riches, or power, or beauty or long life, or health, or happiness--only choose what you will have.' The Rajah was very much puzzled, and he begged leave to be allowed a day to think over the matter and make his choice, to which Gunputti assented. Now it happened that near the palace there lived the son of a Carpenter, who was very cunning, and when he heard that the Rajah went to the temple to learn wisdom, he also determined to go and see if he could not learn it also; and each day when Gunputti gave Vicram Maharajah instruction, the Carpenter's son would hide close behind the temple, and overhear all their conversation, so that he also became very wise. No sooner, therefore, did he hear Gunputti's offer to Vicram, than he determined to return again when the Rajah did, and find out in what way he was to procure the promised gift, whatever it were. Next morning the Rajah, having bathed and prayed, went in great state to the temple to have his final interview with the Idol. And the Carpenter's son went too, in order to overhear it. 'Name it, O good son of a good father,' said Gunputti. The Carpenter's son, who had been all this time listening outside the temple, heard and learnt the spell whereby Gunputti gave Vicram Maharajah power to enter into any other body; but he could not see nor find out what was given to the Rajah to place within his own body when he left it to preserve it, so that he was only master of half the secret. 'Very well,' said the Rajah, and he picked up a parrot which lay dead on the ground, and placing within his own body the beauty-preserving charm, transported his soul into the parrot and flew off. On, on, on he went, over the hills and far away, until he came to the garden. Then he flew over the seven hedges of bayonets, and with his beak broke off the three pomegranates (in which were Anar Ranee and her two ladies) and holding them by the stalks brought them safely home. He then immediately left the parrot's body and re-entered his own body. When Butti saw how well he had accomplished the feat, he said, 'Thank heaven there's some good done already.' All who saw Anar Ranee were astonished at her beauty, for she was fair as a lotus-flower, and the colour on her cheeks was like the deep rich colour of a pomegranate, and all thought the Rajah very wise to have chosen such a wife. They had a magnificent wedding, and were for a short time as happy as the day is long. 'Where and how will you go?' asked the Wuzeer. Having said these words, the Rajah caused a beautiful parrot to be shot (it was a very handsome bird, with a tuft of bright feathers on its head and a ring about its neck). He then cut a small incision in his arm and rubbed into it some of the magic preservative given him by Gunputti to keep his body from decaying, and, transporting his soul into the parrot's body, he flew away. Anar Ranee instructed all her husband's relations and friends as Butti had advised, and the Carpenter's son began to think the life of a Rajah not at all as pleasant as he had fancied, and would, if he could, have gladly returned to his own body again; but, having no power to preserve it, his spirit had no sooner left it than it began to decay, and at the end of three days was quite destroyed; so that he had no alternative but to remain where he was. Meantime the real Vicram Maharajah had flown, in the form, of a parrot, very far, far away, until he reached a large banyan tree, where there were a thousand other pretty pollies, whom he joined, making their number a thousand and one. Every day the parrots flew away to get food, and every night they returned to roost in the great banyan tree. Now it chanced that a hunter had often gone through that part of the jungle, and noticed the banyan tree and the parrots, and said to himself 'If I could only catch the thousand and one parrots that nightly roost in that tree, I should not be so often hungry as I am now, for they would make plenty of very nice currie.' But he could not do it, though he frequently tried; for the trunks of the trees were tall and straight, and very slippery, so that he no sooner climbed up a little way than he slid down again: however, he did not cease to look and long. One day a heavy shower of rain drove all the parrots back earlier than usual to their tree, and there they found a thousand crows, who had come on their homeward flight to shelter themselves till the storm was over. But the other parrots answered, 'That is a very far-fetched idea! Do not let us hunt the poor birds away from shelter in this pouring rain, they will get so wet' So the crows were not molested. It turned out, however, iust as Vicram Maharajah had foretold; for some of the fruits and seeds they were taking home to their young ones fell under the tree, and the seeds took root and sprang up strong creeping plants, which twined all round the straight trunks of the banyan-tree, and made it very easy to climb. Next time the hunter came by he noticed this, and saying, my fine friends, I've got you at last,' he, by the help of the creepers, climbed the tree, and set one thousand and one snares of fine thread among the branches, having done which he went away. That night when the parrots flew down on the branches as usual, they found themselves all caught fast prisoners by the feet. The parrots agreed to do as Vicram Maharajah Parrot proposed, and when the hunter came next morning to take them away, every one of them had his eyes shut and his head hanging down on one side, as if he were dead. Then the hunter said, 'All dead, indeed! Then I shall have plenty of nice currie.' And so saying, he cut the noose that held the first and threw him down. 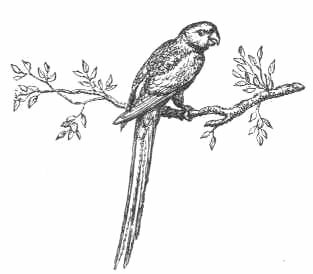 The parrot fell like a stone to the ground, so did the second, the third, the fourth, the fifth, the sixth, the seventh, the eighth, the ninth, the tenth, and so on up to the thousandth parrot. Now the thousand-and-first chanced to be none other than Vicram;--all were released but he. But, just as the hunter was going to cut the noose round his feet, he let his knife fall, and had to go down and pick it up again. When the thousand parrots who were on the ground heard him coming down they thought, 'The thousand and one are all released, and here comes the hunter; it is time for us to be off.' And with one accord they flew up into the air and far out of sight, leaving poor Vicram Maharajah still a prisoner! 'A thousand gold mohurs!' answered the hunter, much astonished. 'You silly bird, who'd be so foolish as to give a thousand gold mohurs for a parrot? 'Polly,' answered the merchant, 'what nonsense you talk!' But he took a fancy to the bird, and paid the hunter a thousand gold mohurs, and taking Vicram Maharajah home, hung him up in his shop. Then the Parrot took on him the duties of shop-man, and talked so much and so wisely, that every one in the town soon heard of the merchant's wonderful bird. Nobody cared to go to any other shop--all came to his shop, only to hear the Parrot talk; and he sold them what they wanted, and they did not care how much he charged for what he sold, but gave him whatever he asked; insomuch that in one week the merchant had gained a thousand gold mohurs over and above his usual weekly profits; and there Vicram Maharajah Parrot lived for a long time, made much of by everybody, and very happy. It happened in the town where the merchant lived there was a very accomplished Nautch-girl, named Champa Ranee. 6She danced so beautifully, that the people of the town used always to send for her to dance on the occasion of any great festival. There also lived in the town a poor woodcutter, who earned his living by going daily far out into the jungle to cut wood, and bringing it into the bazaar to sell. One day he went out as usual into the jungle to cut wood, and, being tired, he fell asleep under a tree and began to dream; and he dreamed that he was a very rich man, and that he married the beautiful Nautch-girl, and that he took her home to his house, and gave his wife, as a wedding present, a thousand gold mohurs! 'What a funny dream!' they cried, and thought no more about it. The woodcutter thought he must be dreaming; but all Champa Ranee's friends and relations declared that what she said was true. Then after much quarrelling they said they would go to law about it; but the judge could not settle the matter, and referred it to the Rajah himself. The Rajah was no less puzzled than the judge. The woodcutter protested that he was only a poor woodcutter; but Champa Ranee and her friends asserted that he was, on the contrary, a rich man, her husband, and had possessed much money, which he must have squandered. She offered, however, to give up all claim to that if he would only give her a thousand gold mohurs, which he had promised her as a wedding present; and so suggested a compromise. The woodcutter replied that he would gladly give the gold mohurs if he had them; but that (as he brought witnesses to prove) he was really and truly what he professed to be, only a poor woodcutter, who earned two annas' a day cutting wood, and had neither palace, nor riches, nor wife in the world! The whole city was interested in this curious case, and all wondered how it would end; some being sure one side was right, and some equally certain of the other. So Vicram Maharajah Parrot was sent for, and placed in the Court of Justice, to hear and judge the case. 'Agreed,' said Champa Ranee, 'we will soon see whose words come true, mine or yours,' and so saying, she returned home. 'What nonsensical idea is this of our mistress?' said the maid to another, as she took the parrot into the kitchen; 'to think of eating a grilled parrot's head!' 'Never mind,' said the other; 'you 'd better prepare it as she bids you, or she 'll be very cross.' Then the maid who had received the order began plucking the long feathers out of Vicram Maharajah's wings, he all the time hanging down his head, so that she thought he was dead. Then, going to fetch some water in which to boil him, she laid him down close to the place where they washed the dishes. Now, the kitchen was on the ground-floor, and there was a hole right through the wall, into which the water used in washing the dishes ran, and through which all the scraps, bones, peelings, and parings were washed away after the daily cooking; and in this hole Vicram Maharajah hid himself, quick as thought. Vicram, in the hole close by, heard her, and felt very much frightened; for he thought, 'If she should catch me after all I' He could not fly away, for all his wing-feathers had been pulled out; so there he had to stay some time, living on the scraps that were washed into the hole in the washing of the plates, and perpetually exposed to the danger of being drowned in the streams of water that were poured through it. At last, however, his new feathers were sufficiently grown to bear him, and he flew away to a little temple in the jungle some way off, where he perched behind the Idol. It happened that Champa Ranee used to go to that temple, and he had not been there long before she came there to worship her Idol. Champa Ranee believed what she heard, and, forgetful of Vicram Maharajah Parrot's threat, hastened to do as she was bidden. She sold her possessions, and gave all the money to the poor; razed her house to the ground, and dismissed her servants, which being accomplished, on the day appointed she went to the temple, and sat on the edge of a well outside it, explaining to the assembled people how the Idol himself had spoken to her, and how they would shortly see her caught up to Heaven, and thus her departure from the world would be even more celebrated than her doings whilst in it. All the people listened eagerly to her words, for they believed her inspired, and to see her ascension the whole city had come out, with hundreds and hundreds of strangers and travellers, princes, merchants, and nobles, from far and near, all full of expectation and curiosity. Then the woman saw all, and in her rage and despair, cursing her own folly, she fell violently down on the floor of the temple, and, dashing her head against the stone, killed herself. It was now two years since the Rajah Vicram left his kingdom; and about six months before, Butti, in despair of his ever returning, had set out to seek for him. Up and down through many countries had he gone, searching for his master; but without success. As good fortune would have it, however, he chanced to be one of those strangers who had come to witness the Nautch-girl's translation, and no sooner did he see the Parrot which spoke to her, than in him he recognised Vicram. The Rajah also saw him, and flew on to his shoulder, upon which Butti caught him, put him in a cage, and took him home. Now was a puzzling problem to be solved. The Rajah's soul was in the parrot's body, and the Carpenter's son's soul 'in the Rajah's body. How was the latter to be expelled to make way for the former? He could not return to his own body, for that had perished long before. The Wuzeer knew not how to manage the matter, and determined therefore to await the course of events. It happened that the pretended Rajah and Butti had each a fighting ram, and one day the Rajah said to the Wuzeer, 'Let us set our rams to fight to-day, and try the strength of mine against yours.' 'Agreed,' answered the Wuzeer; and they set them to fight. But there was much difference in the two rams; for when Buttj's ram was but a lamb, and his horns were growing, Butti had tied him to a lime-tree, and his horns had got very strong indeed by constantly rubbing against its tender stem, and butting against it; but the Carpenter's son had tied his ram, when a lamb, to a young teak-tree, the trunk of which was so stout and strong, that the little creature, butting against it, could make no impression on it, but only damaged and loosened his own horns. The pretended Rajah soon saw, to his vexation, that his favourite's horns being less strong than its opponent's, he was getting tired, and, beginning to lose courage, would certainly be worsted in the fight; so, quick as thought, he left his own body and transported his soul into the ram's body, in order to give it an increase of courage and resolution, and enable it to win. No sooner did Vicram -Maharajab, who was hanging up in a cage, see what had taken place, than he left the parrot's body and re-entered his own body. Then Butti's ram pushed the other down on its knees, and the Wuzeer ran and fetched a sword, and cut off its head; thus putting an end with the life of the ram to the life of the Carpenter's son. Great was the joy of Anar Ranee and all the household at recovering the Rajah after his long absence; and Anar Ranee prayed him to fly away no more as a parrot, which he promised her he would not do. But the taste for wandering, and love of an unsettled life, did not leave him on his resuming his proper form; and one of the things in which he most delighted was to roam about the jungles near the Palace by himself, without attendant or guide. One very sultry day, when he was thus out by himself, he wandered over a rocky part of the country, which was flat and arid, without a tree upon it to offer shelter from the burning sun. Vicram, tired with his walk, threw himself down by the largest piece of rock he could find to rest. As he lay there, half asleep, a little Cobra came out of a hole in the ground, and, seeing his mouth wide open (which looked like some shady cranny in a rock), crept in and curled himself up in the Rajah's throat. Vicram Maharajah called out to the Cobra, 'Get out of my throat!' But the Cobra said, 'No, I won't go; I like being here better than under ground.' And there he stayed. Vicram didn't know what to do, for the Cobra lived in his throat, and could not be got out. At times it would peep out of his mouth, but the moment the Rajah tried to catch it, it ran back again. Butti sent messengers far and wide seeking Vicram Maharajah, but they could not find him; be then determined to go himself in search of his lost friend; and having made proper arrangements for tile government of the country during his absence, he set off on his travels. Meantime Vicram wandered on and on, until at last one day he came to the Palace of a certain Rajah, who reigned over a country very far from his own, and he sat down with the beggars at the Palace gate. But the Princess persisted that one of them was the Rajah Vicram. Then the Ranee sent for Vicram Maharajah, and questioned him. 'I will marry him, and follow him wherever he goes,' said the Princess. Vicram built a little hut in the jungle, and there they lived; but the poor Princess had a sad time of it, for she was neither accustomed to cook nor wash, and the hard work tired her very much. Her chief grief, however, was that Vicram should have such a hideous tormentor as the Cobra in his throat; and often and often of a night she sat awake, trying to devise some means for catching it, but all in vain. At last, one night when she was thinking about it, she saw, close by, two Cobras come out of their holes, and as they began to talk she listened to hear what they would say. 'Who are these people?' said the first Cobra.--' These,' said the second, 'are the Rajah Vicram, and his wife the Princess Buccoulee.' --'What are they doing here? why is the Rajah so far from his kingdom?' asked the first Cobra. 'Oh, he ran away, because he was so miserable; he has a cobra that lives in his throat,' answered the second. 'Can no one get it out?' said the first. 'I never heard of that before,' said the first Cobra. 'Didn't you?' exclaimed the second; 'why, if they did the same thing at the mouth of your hole, they'd kill you in no time; and then, perhaps, they might find all the fine treasure you have there! ' --'Don't joke in that way,' said the first Cobra, 'I don't like it;' and he crawled away quite offended, and the second Cobra followed him. Buccoulee next caused the caldron of oil to be placed close to the hole of the first Cobra, which she had heard speaking the night before, and he was suffocated. She then ordered the people to dig him out of his hole; and in it they found a vast amount of treasure--gold, silver, and jewels. Then Buccoulee sent for royal robes for herself and her husband, and bade him cut his hair and shave; and when they were all ready, she took the remainder of the treasure, and returned with it to her father's house; and her father and mother, who had repented of their harshness, gladly welcomed her back, and were both surprised and delighted to see all the vast treasures she had, and what a handsome princely-looking man her husband was. Then one day news was brought to Vicram that a stranger Wuzeer had arrived in the Palace as the Rajah's guest, and that this Wuzeer had for twelve years been wandering round the world in search of his master, but not having found him, was returning to his own home. Vicram thought to himself; 'Can this possibly be Butti?' and he ran to see. 1 The great King Vicram. 6 The Champa Queen. The Champa (Michelia Champaca) is a beautiful sweet-scented yellow flower.